Give your mobile performances some lighting punch with the feature-packed Intimidator Spot 260. It features a 75W LED and motorized focus that lets you project crisp gobos from nearly any distance. Throw light farther by decreasing the beam angle 5° using the manual zoom. Keep the party energized using Totem mode that keeps beams on the dance floor and a 3-facet prism splits the beam and covers a larger area to thrill event guests. Intimidator Spot 260 lets you set, save, and recall 1 scene manually, directly from the full-color LCD display. Link up to 4 fixtures to create eye-catching, synchronized shows in Automated or Sound mode. You can also use convenient, wireless non-DMX control using the optional IRC-6 remote. Intimidator Spot 260 has powerCON®-compatible power input/output connections for power linking. ¼-turn hanging bracket allows for quick removal when needed. Considering purchasing the Chauvet Intimidator Spot 260? Have questions? Ask people who've recently bought one. Do you own the Chauvet Intimidator Spot 260? Why not write a review based on your experience with it. Really nice moving head. Nice and quick on moment and as bright as you want. This light is great and gives a rich colour flood with good control on DMX to create some nice gobo effects and movement. Love it. 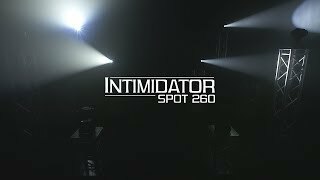 Seen a video for Chauvet Intimidator Spot 260 online or have you own video? You will earn 1,198 loyalty points with this product worth £3.00, when logged in. 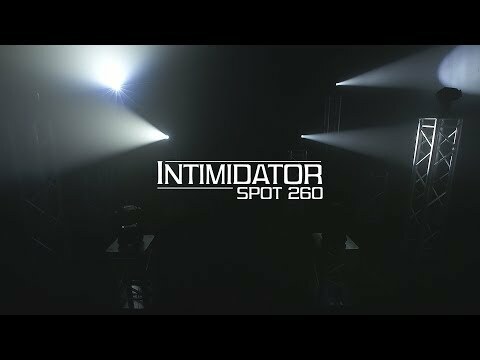 Check out Chauvet Intimidator Spot 260 on DJkit.com!